Restaurant Equippers has over 40 years of experience in shipping products throughout the United States and to several international locations as well. Our shipping policy and process is designed to help customers receive their orders quickly, safely and for the lowest price possible. Restaurant Equippers ships to all registered U.S. Post Office commercial and residential addresses throughout the United States. We ship to all locations outside the U.S.A. that are serviced by Federal Express®. Our large shipping volume earns us huge discounts on common carrier and FedEx costs, and we pass on those savings directly to customers. Our customer shipping charges are calculated to pay only for our Company's actual discounted carrier shipping costs, and are not increased to create hidden shipping profits, and we do not charge “handling fees”. Charges are normally calculated using our distribution center in Ohio as the point of origin, except for Special Orders that may be shipped directly from our manufacturer. We attempt to ship all orders complete in the most economical and fewest number of cartons possible. Small package orders are normally shipped via FedEx Ground, and oversized, heavier, and bulk items place on wooden pallets are normally shipped via Freight / Common Carrier. When placing an Internet Order for a small package shipment that will be shipped by FedEx, Discounted FedEx Ground shipping charges are automatically calculated for your order using our Distribution Center in Ohio as the point of origin, and the price is quoted at the time of your checkout. your shipment will be scheduled via Freight/Common Carrier, are automatically calculated for your order using our Distribution Center in Ohio as the point of origin, and the price is quoted at the time of your checkout. Calculated shipping costs include a lift gate and delivery notification. Orders totaling 500 lbs. or more in shipping weight will automatically be categorized and processed as a Freight Delivery order. If your order exceeds 10 pallets freight will need to be calculated by one of our Equipment Supply Specialists due to the complexity of shipping an order of that size. Since you will not see your final shipping costs at the time of ordering, payment/credit card information will not be requested at that time. Within 24 hours (except for Saturday Evening / Sunday Morning / or Holidays), an Equipment and Supply Specialist from our Nationwide Order Office will contact you via Email and/or phone and will help you determine whether any additional delivery services are required as a result of the size or weight of your shipment. They will advise you of your final shipping charges at that time, and obtain your final approval and payment information prior to shipping. 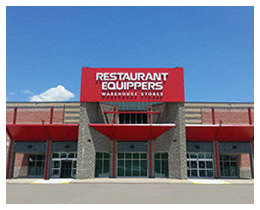 Restaurant Equippers offers free shipping on select items. Free Shipping is restricted to addresses within the contiguous U.S. (i.e. excludes orders to Alaska, Hawaii, military APO/FPO addresses, U.S. Territories and International addresses.) Restaurant Equippers reserves the right to select the shipping method on all Free Shipping items. For items to restricted addresses, contact Restaurant Equippers via phone or chat for a shipping quote. Expedited shipping, while not a free option, may also be available. Standard shipping charges will be deducted from expedited shipping charges on free shipping items. Please contact us if you need this or other services. Due to our vast inventory of in-stock products, most orders are shipped from our distribution center in Ohio no later than the following business day after payment is received. If your call is received early enough in the day, Restaurant Equippers’ Specialists can often coordinate an immediate, same day shipment from our distribution center in Ohio. However, all orders are subject to product availability and shipment according to our general shipping policies and procedures. Depending upon your location and delivery requirements, our specialists can help you coordinate the most economical option for expediting delivery. However, Restaurant Equippers cannot guarantee a Carrier’s delivery time. Due to our vast inventory of in-stock products, most orders are shipped from our distribution center in Ohio no later than the following business day after the order is received. However, all shipments are subject to product availability and our general shipping policies and procedures. Small packages are normally shipped from our distribution center via FedEx Ground, which, depending on your location, will normally be delivered in the United States between 1 to 5 business days following shipment, depending on your location. Larger and heavier shipments are normally shipped from our distribution center via Freight/Common Carrier, which will normally be delivered in the United States anywhere between 1 to 7 business days following shipment, depending on your location. For shipments outside the U.S.A., please contact us regarding the potential delivery time based on your location and the size of your order. If you have a question regarding anticipated delivery times to your area (or if you’d like to expedite an emergency order) immediately call Customer Service (800-235-3325) and we’ll confirm your options with you. However, Restaurant Equippers cannot guarantee a carrier’s delivery time! Whenever you desire to expedite an Internet Order, enter a request to expedite the shipment onto your order and immediately call the Nationwide Order Office (800-235-3325). An Equipment and Supply Specialist will coordinate your expedited shipping needs, advise you of the costs, and obtain your approval prior to shipping. Such shipments normally require additional FedEx or Freight/Common Carrier Shipping Charges. Anticipated Delivery Time From Distribution Center if ordered before 3:00pm EST. Larger and heavier shipments are normally shipped from our distribution center via Freight/Common Carrier and, depending on your location, will normally be delivered anywhere between 1 to 7 business days following shipment. Other options (available at additional common carrier charges), may or may not be of value to you, depending on your location. If you are located near our Columbus, Ohio, Detroit, Michigan , or Pennsauken, New Jersey Warehouse Stores, you may wish to save shipping costs by picking up your order directly, rather than having it shipped to you. Thousands of food service operators come to our stores with trucks or trailers and transport their purchases back to their place of business. Orders that you choose to pick up at one of our locations will be available for pick up 2 hours after the order is placed, provided all items are in-stock and the order is received before 3:00pm (EST) Monday thru Friday. If your order is placed after 3:00pm (EST) Monday thru Thursday, it will be ready for pick up after 10:00am (EST) the following day. If it is placed after 3:00pm (EST) on Friday or anytime on Saturday or Sunday, it will be available for pick up after 10:00am (EST) Monday. Please provide your name and phone number to reach you if there are questions or concerns regarding your order. All orders placed online for warehouse store pick-up must be paid for in the store at the time of pickup. For credit card transactions, you will also be asked to present your credit card and ID when you pick up your order. Please note; not all items are available at all stores. Our store hours are M-F 8:00am-5:00pm (EST), Saturday 8:00am-12:00pm (EST). We are closed on Sunday. Please call our Nationwide Order Office (800-235-3325) for assistance or to answer questions regarding Warehouse Store Pick-Up. FedEx (i.e. small package) shipments are normally easy to coordinate. However, larger and heavier Freight/Common Carrier shipments often require additional delivery considerations. Our discounted shipping charges apply to freight deliveries made to commercial addresses. Additional fees may be required when shipping to a residential address. Orders that require date-specific delivery may also incur additional fees. If any other order requires special shipping or delivery assistance, please note such requests in the comments field when submitting your order or call us immediately during business hours (800-235-3325) and an Equipment and Supply Specialist will help confirm and process your special handling requests (which may incur additional costs). If you need to change or cancel an order, contact us during our business hours as soon as possible (800-235-3325). If the order has not already been shipped, we will stop the order and perform any changes and cancellations required to correct your order prior to shipping. If the item has already been shipped, please refer to our 30-Day Return Policy for more information. Restaurant Equippers has relationships with many of the best food service equipment and supply manufacturers in the industry, and we can often obtain products which are not featured on our Website, Catalog, or in our Warehouse Store. Such items are considered Special Orders and require personal assistance from our Equipment and Supply Specialists to identify your specific requirements, confirm availability, and coordinate your purchase and shipment from the manufacturer. Special Orders must be paid for at the time of placing your order with the manufacturer, and if shipped directly to you from the manufacturer, may have shipping charges different than those for a similar item carried and shipped to you from our distribution center. Although our specialists will make every effort to ensure that you receive your special order from the manufacturer at the earliest possible date, Restaurant Equippers does not ensure the timely delivery of Special Order items. Contact us (800-235-3325) for help with Special Orders. If shipment is not received as anticipated, contact Restaurant Equippers’ Customer Service (800-235-3325) and a Customer Service Specialist will help you locate and obtain the lost shipment, or will assist you in replacing the items shipped if they have been lost by the freight carrier. Inspect the entire shipment for visible damage prior to accepting the shipment and note any visible damage onto the delivery ticket/bill of lading before the delivery person leaves. For packages left at your doorstep, inspect the exterior of the carton and note any large dents or tears onto your Restaurant Equippers packing list. Verify the number of packages delivered against the packing slip provided by Restaurant Equippers, and note any difference onto the packing slip. Unpack your order immediately and inspect for hidden or concealed damage or missing items, even if you do not plan on using the items right away. Contact Restaurant Equippers Customer Service (800-235-3325) to report the situation and obtain their assistance in replacing the damaged, missing, or incorrectly shipped products. Please have your order number, shipping information, and tracking number ready when calling. Restaurant Equippers will replace any item sent to you in error, received defective, or received damaged in shipping and will arrange for the return shipping to our distribution center of such items (assuming that the order check-in procedure and reporting outlined above has been reasonably followed).